Another excellent beginner's guide from Kalmbach Press! 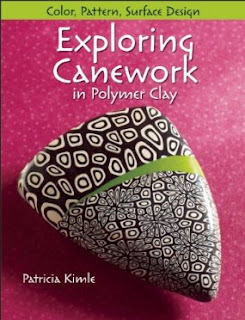 Exploring Canework in Polymer Clay was written by Patricia Kimle, whose work should be immediately recognizable to those who love mixing polymer and metal clays. Let me just state again that this is a much more basic book than you may have seen from Patricia before, so take that into account if you decide you want a copy. 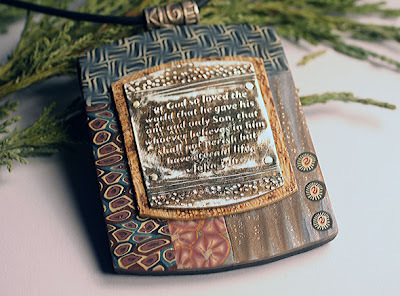 of Patricia's beautiful mixed media work from her website. But look at those canes! Cool, huh? That is what Patricia teaches in the book! Patricia starts off with some basics of working with polymer clay in any technique, which makes it a particularly good book for a beginner who knows that canework is what draws them. She moves into color lessons, how to do a Skinner blend, and the basics of canework: constructing, reducing, and repeating. And slicing! We can't forget that. The reader is then taken through a selection of simple through complex canes, with the complexity increasing as you move through the book. Some of the canes combine several earlier, easier techniques to create pieces that would have been hard to figure out if you hadn't read this book. Would you like to win a free copy of this book? Here's what you need to do...please read this carefully. Leave me a comment here and include your email address. If I don't see your email address, I won't be able to contact you. No contact, no win, and I simply have to go on to the next person. You are welcome to spell it out if you'd prefer, for example, cyndi at mazeltovjewelry dot com. If you tweet or post on Facebook or other social spots about the contest, you can leave a second comment and be entered twice! Deadline: June 12, 2013. I would sooo love to win this book. I've not been happy with anything I've done with clay yet and this looks like the book for me. Thanks, now off to check out the rest of your blog! Would love to learn more about canes! Just tweeted about this book and giveaway. I so want to learn poly clay! I am in awe of all of the beautiful work that she does! Pretty please count me in for this amazing giveaway! Thanks! I would love to win this book because I know nothing about clay. Thank you, Cyndi! I have been drooling over this book! Thank you for offering the giveaway! Hello, I would like to be entered in the contest to win “Exploring Canework in Polymer Clay by Patricia Kimle. My email address is rmicallef at rogers dot com. I want to learn polymer clay! How cool would it be!! I have been interested in playing with polymer clay so I would love this book. What a way to get started and thank you so much for holding this contest. Hi Cyndi Thanx for a chance to win this great book.